Birt and Etho are best friends; they play wonderful games together using just their imagination… and two very large cardboard boxes. One day another boy called Shu arrives with a box of his own wanting to join the fun. What will happen to Birt and Etho’s friendship if Shu joins in too? 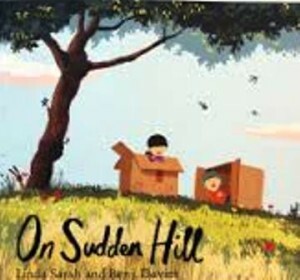 This is a beautifully illustrated and sensitively told story about friendship, feeling left out and coping with change. It is also a story full of wonderfully imaginative play ideas. Before reading the book to your child, talk about the illustrations on the front and back covers together and encourage your child to think what might happen in the story. Then read the story aloud pausing to talk about the story when your child wants to. As you read the book again leave gaps so your child can join in with all the things the characters in the story do. Look at some of the double page spreads together and have imaginary conversations as if you are the characters in the story. You could add sound effects as well for example knocking on the door. Share favourite pages and talk about them. Talk about how Birt feels at different points in the story. How do we know? Collect some big boxes to play imaginary games, for example you could help your child create a rocket, a castle or a pirate ship with a cardboard tube, telescope and paper flag. If you are feeling very creative join several boxes together, add some paint or decoration and make an incredible monster box! Fold a piece of paper into four sections. Your child could draw four pictures of some of the things the friends in the story do with their boxes. Your child could write an imaginary message as if they are Etho or Birt inviting Shu to play with them. Or a thank you message from Shu to his two friends for making him the incredible monster box.